Welcome to Day #3 of Chocolate and Orange Theme Week. Today's Orange Almond Vanilla 60% Cacao Organic Dark Chocolate bar from The Tea Room (San Leandro, CA). 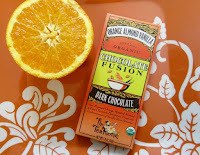 The bar was part of the company's Chocolate Fusion line of chocolate containing tea. The dark chocolate had a bittersweet dark aroma with a hint of citrus, and roasted almond (extract) notes, with a dose of vanilla sweetness. 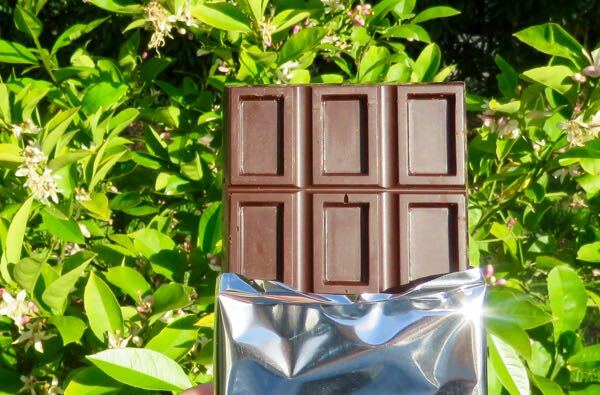 The company's chocolate bars are USDA Organic, Non-GMO verified and gluten free and made with Fairtrade chocolate. *Ingredients: "Organic Unsweetened Chocolate, Organic Cane Sugar, Organic Cacao Fat, Organic Roasted Almonds, Organic Black Vanilla Tea, All Natural Orange Flavor"